Thread: How currencies are traded in Forex? 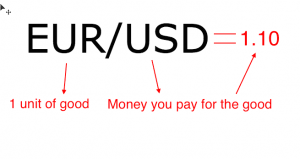 A currency that comes before “/” is called “base currency” (good), currency that comes after “/” is called “quote currency” (money you pay for the good) and the number in right side is “exchange rate”. In our case EUR/USD=1.10 means that if we buy 1 EUR we pay 1.10 Dollars, if we sell 1 EUR we get 1.10 Dollars. USD/JPY = 118.20 – to buy 1 Dollar we pay 118.20 Japanese Yens, if we sell 1 Dollar we get 118.20 Yens. EUR/GBP= 0.77 to buy 1 Euro we pay 0.77 pounds. So what “EUR/USD rose from 1.10 to 1.12” exactly mean? 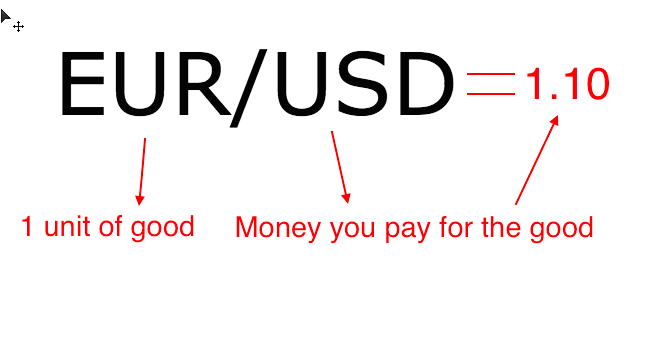 It means that to buy 1 Euro we now need more Dollars (1.12 USD instead 1.10 USD). In other words we need to spend more Dollars to buy Euros or Euro became more expensive that USD. When exchange rate rise = base currency become more expensive or quote currency become cheaper. When exchange rate drops = base currency become cheaper or quote currency become more expensive. Hope its clear. Moving further. Now we understand which exact changes mean fluctuations in exchange rate. So if we expect that exchange rate of EUR/USD will rise how to profit from it? The answer is – we should buy EUR/USD. When we make such transaction it means that we buy EUR and pay with USD for it. And vice versa, when we sell EUR/USD it means that we sell EUR and get USD instead. For example you think that exchange rate of EUR/USD will rise from 1.10 to 1.20. You buy 100 000 EUR paying 110 000 USD for it. Then exchange rate rises from 1.10 to 1.20 and you execute reverse transaction: Sell your 100 000 EUR and get 120 000 USD instead. Net profit is 10 000 USD. But what happens if exchange rate falls short of your expectations and drop from 1.10 to 1.00? You buy 100 000 EUR for 110 000 USD but when making reverse transaction when exchange rate dropped to 1.00 you get back only 100 000 USD. Net loss is 10 000 USD. Here we have important conclusion: Any trade consists of two transactions, where second transaction is reverse to first. We already know such currency pairs like EUR/USD, USD/JPY, AUD/USD. But how much pairs there are and what pairs are best to trade? Let me try to answer this questions. Trading is possible providing that there is a counterparty willing to sell you what you want to buy and buy what you want to sell, i.e. make an exchange with you. When you want to sell EUR/USD there should be a counterparty willing to buy EUR/USD in the same amount. Same for reverse transaction. It is quite logical that the more members willing to exchange the better for every member as they can complete exchanges faster. Its called Liquidity. The bigger is Supply and Demand the better is liquidity. Did you guess which currency pair is most liquid? Of course it is EUR/USD. It means that if you decide to buy 10 000 000 EUR for USD at current exchange rate I’m pretty sure you can do that almost Instantly. But if you try to exchange 10 Million Dollars for example to Mexican Pesos it should take some more time because there’s less Supply of Pesos and probably less demand for such amount of Dollars (less number of market participants). In this case, it is said market has thin liquidity. EUR/USD, USD/JPY, GBP/USD, USD/CHF, AUD/USD, USD/CAD. Why are they? Because United States, European Union, Japan, Switzerland, Canada, Australia are biggest economies in the world thus has biggest Supply and Demand on their national currencies on foreign exchange market. EUR/CHF, EUR/JPY, NZD/JPY, EUR/GBP, CAD/JPY. These are just some of them. Why are they called cross pairs? Because these are major currencies but not quoted in Dollar. They are less liquid than majors but enough to trade with large positions (200 000, 500 000 currency units or even more). USD/RUB, USD/TRY, USD/NOK, USD/MXN, USD/ZAR, USD/SGD. Most of them has USD as second currency because only with USD they have adequate liquidity to make trading possible. Okay, now we know that there are three types of currency pairs and they all have different liquidity. But what pair to choose for trading? Actually the question is incorrect . Quick glance may suggest that best pair to choose is EUR/USD or other majors. But its not absolutely true. For example USD/MXN may be more preferable for you because you’re living in Mexico and know your national currency – Mexican Peso (MXN) better than international traders. You can get quicker access to local news, events, government decision that may affect currency and thus USD/MXN exchange rate and turn it into your favor. In trading terminology its called “EDGE”. Having an edge means know something that other traders may don’t know and what you can use to predict the moves of certain currency. Trading knowledge, access to information and quick response are three main constituents of consistent profitable trading. In next lesson we will study what are transactions costs – Spreads and commissions and how they connected to liquidity of a pair. We will also find out what are other expenses you can incur during your trading. Very interesting. Waiting for updates and new articles. BTW How I can understand why pip value on some currency pairs are not calculated like major ones. Take for example USD/JPY or USD/RUB - completely different. What is Forex Trading and how it works? FOREX (abbr. from Foreign Exchange) in the broad sense – an aggregate of exchange operations between large banks and other financial institutions like pension funds, insurance companies and transnational corporations. The needs to carry out such exchanges can be different – banks and companies keep reserves in different currencies for their operational needs, hedge funds buy and sell currencies to earn on fluctuations of exchange rates. 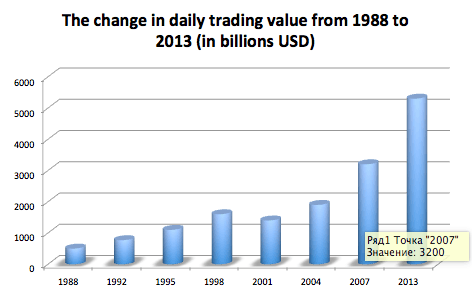 The daily volume of transactions on Forex market is incredibly high – about $5.3 trillion per day in April 2013. It greatly exceeds the turnover on stock markets – for example daily trading value of biggest stock exchange NYSE averaged only $169 billions in 2013. 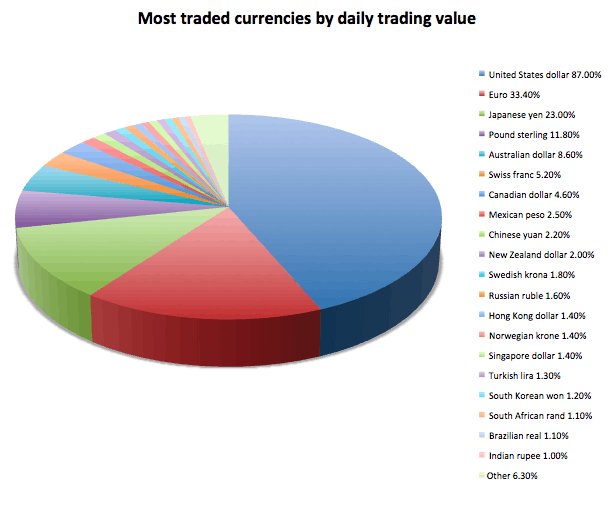 As we can notice, USD and EURO represent most traded currencies in the world with about 3/4 of daily trading volume. 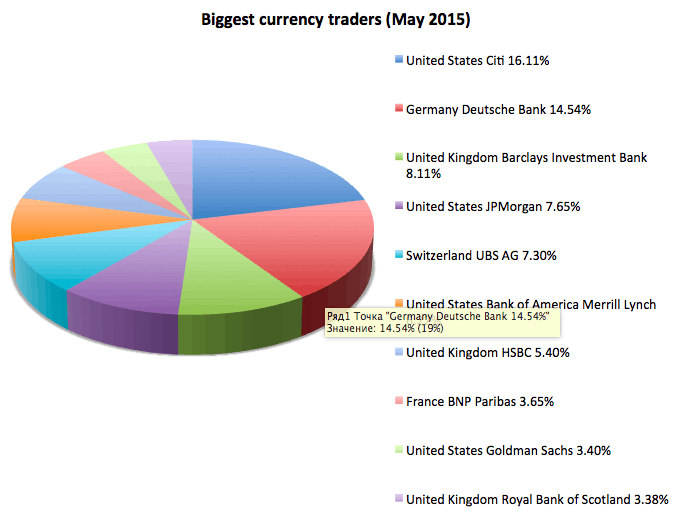 US and European banks seems to be the biggest currency traders. Daily trading volume has been steadily growing throughout the given period with a dip in 2001 caused by financial crisis in 1998. So, when we hear something like “Euro became weaker against Dollar” or “Japanese Yen appreciated against Australian Dollar” it invites reasonable question: What makes exchange rates fluctuate? To answer this question lets consider the state as a big company and national currency as its share. As logic suggests the better company performance the more value receives its shares. So basically, changes in exchange rates reflect how one company (country) outdo in performance other company (other country). There are tons of domestic circumstances that leave impact on a country’s economy. By and large we can divide them in two categories: Internal and External. All of them in their underlying principle contain the theory of Supply and Demand. Macroeconomic changes, geopolitical events, natural disasters can be referred to domestic factors, while changes in commodity prices (especially energy), increasing or decreasing supply or demand for certain goods can be considered as external. Russian Central bank decides to increase interest rate for Ruble => borrowing costs of Ruble increase (money “become more expensive”) => Russians borrow less and spend less, Foreign Investors tend to buy Ruble as it ensures more return => Amount of this currency on forex market decrease (thus the demand for it increase) => the value of Ruble increase. China Oil consumption fall => Supply doesn’t change so world market gets oversupplied with Oil=> Price on Oil declines => Oil return for exporters like Russia drops => Russian economy deteriorates => Ruble becomes cheaper. Of course these two basic examples demonstrate clearly how currencies are affected by certain circumstances and describe fluctuations in their plain way, but given that the number of factors can reach thousands or millions its impossible to predict how the exchange rate will change in next 5 minutes (obviously current computational capacities are not enough to collect and analyze all information that may have impact on certain currency). Its essential to know that important economic and political events form only long-term trends in exchange rates – the wave that can form weeks or months or even years, consisting of numerous smaller waves. Alright, seems we’ve dealt with a notion of exchange rate fluctuations. Let’s take a look under the hood. London session is considered biggest by trading volume, second is New-York session. Asian and Australian sessions feature with lowered trading activity (amount of transactions). The overlap of London and New-York session is considered to be most active time of trading. In trading terms it means “time of best market liquidity”. That’s it for today. In next article we’ll get insight into how retail forex trading works and how access to biggest market in the world can be served to any trading newbie. which currency pair is best to trade.???? Every one is busy with EUR/USD but i want to know other one also. There are so many currency pairs in Forex to trade independently but i think that USD/JPY is the best currency pair to profit much in Forex.